BD. Indicator / Powerhouse. Region Free. 15. Although he longed for recognition as a serious director of quality Cinema (and nearly attained it in 1968, before Roman Polanski replaced him as director of Rosemary’s Baby), William Castle knew in his heart of hearts that he was no Hitchcock. If he couldn’t outshine his idol on the silver screen however, he resolved to do outdo him as a showman… and boy, did he ever succeed! After about a decade-and-a-half as a hired B-movie director for hire, working on crime pictures and Westerns (including the 3-D Fort Ti in 1953) our man formed William Castle Productions to make Macabre in 1958 and The House On Haunted Hill the following year. The first named of those is a routine “race against time to rescue a girl who’s been buried alive” thriller, best remembered for the piece of promotional hokum by which Castle insured every ticket buyer with Lloyd’s of London, to the tune of $1,000, against the eventuality of them dying of fright while watching the movie. Nurses were posted in cinema lobbies and hearses parked outside. All very jolly, but Castle’s Barnum-esque antics were ramped up exponentially for House On Haunted Hill (in which jaded patrician Vincent Price bets an ill-assorted cast of characters that they can’t survive a night in his doomed domicile) by the introduction of the “Emergo” process, which purported to surpass 3-D by having ghosts emerge from the screen… in fact it consisted of a joke shop skeleton advancing shakily over the viewers’ heads on a rail. To compound viewer hysteria as The Tingler traversed the aisles, selected cinema seats were wired to vibrate and impart an appropriate tingling sensation to random lucky punters’ butts, a marketing coup dubbed “Percepto” by the tirelessly, dementedly inventive director. Not content with accompanying his films on promotional tours, playing an active part in his own fan club and appearing in trailers, Castle was now boosting his brand by popping up in the main features themselves, introducing the stories and demonstrating to viewers how best to participate in each film’s interactive gimmick. Hitchcock himself was taking notice of Castle’s low-budget, high hype strategy (consider the celebrated trailer for Psycho, 1960… indeed, the very existence of Psycho) though Castle returned the favour in characteristically on-the-nose fashion with Homicidal (1961). Notoriously stingy, Castle always couched his refund offers in terms that audience members would be reluctant to take up and the same tight-fistedness would also be apparent when it came to filming the alleged alternative endings for Mr Sardonicus (1961). An uncharacteristic period picture with Gothic leanings, this one recounts the outrageous exploits of its libertine title character (Guy Rolfe)… digging up his father’s corpse, trussing attractive young women up and applying leeches to then (interestingly foreshadowing the onscreen exploits of Brazil’s Coffin Joe, who first came to the world’s astonished attention in At Midnight I’ll Take Your Soul, three years later) and do on. On account of his desperate misdeeds, Mr S develops a grotesque rictus grin so fixed that ultimately it prevents him from eating or drinking (sure thing… whatever…) At this point the director appears onscreen to count the audience’s votes, as registered via the “thumbs up / down” cue cards that they were issued with on entry, this “Punishment Poll” deciding whether Sardonicus died or was cured of his affliction. Knowing full well that nobody was ever going to vote for the latter, Castle didn’t waste a cent on shooting more than one ending. Even if you’ve never had the good fortune to see these movies, the above descriptions have hopefully clued you in on exactly how much fun you ‘re going to have with them. Each is presented here with gimmicks intact (their on-screen components, anyway… you’ll have to rig your own sofa to vibrate and knock up your own Coward’s Corner somewhere in your living room), what’s more this set is appropriately equipped with a host of cherishable extras… audio commentaries, interviews, featurettes, archive promotional footage, trailers (with commentaries), isolated music and sound FX tracks and appreciations from the likes of Jonathan Rigby, Stephen Laws and Kim Newman (who points out that even in his autobiography, Castle had more to say about the wiring of cinema seats for The Tingler than about that film’s astonishing content). Best of all, this set includes Jeffrey Schwarz’s 2007 feature-length bio documentary Spine Tingler! The William Castle Story, a visually inventive celebration of this showman nonpareil with contributions from his daughter Terry and the likes of Roger Corman, Joe Dante, Forrest J. Ackerman and John Waters, who was instrumental in getting this project off the ground. You also get a short featurette on the making of Spinechiller! and, just to prove that these Indicator people are nothing if not thorough, the latter comes with its own commentary track. 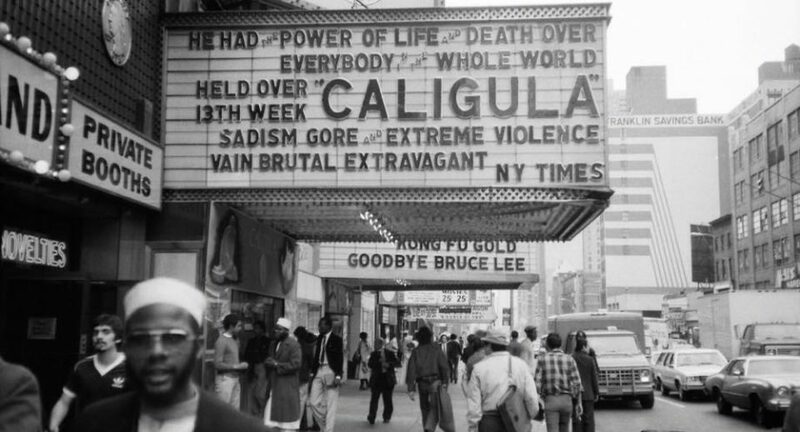 Interesting (and a little troubling) to learn that in his pre-cinema days as a theatre impresario, Castle was not above faking up Nazi desecrations to put more bums on seats. Nor does the doc shy away from Castle’s darker final years, when the once-cynical purveyor of schlock horror came to believe that his production of Rosemary’s Baby had unleashed genuine bad karma on some of its participants. Limited to 6,000 numbered copies, this special edition of William Castle At Columbia comes with exclusive booklets (which I haven’t seen) boasting new essays and archival materials. Volume 2 will join it in December… assuming you’re brave enough to remain in your seats for that!